Chess is a complex game. You might think chess experts would take some time to come to a decision. First of all, they must study and make a careful analysis of the board. Next, they have to consider all the possible moves available and weigh up all of the possible counter-moves by their opponent. Then, by a process of logical deduction, they select the best move to make. But, if you watch a chess Master at work, particularly if they are playing an exhibition tournament against a large number of lesser players, you will see they move very quickly, often seeming to assess the board and make their choice in a matter of seconds. Watch a Chess Master at work and it almost looks at though the Master isn’t thinking at all! How does this happen? And what can we learn from chess that might help us improve the speed and quality of own decision-making? Let’s look at how chess players use their knowledge of chess during a match. During a game, experienced chess players aren’t looking at the board as if it was something completely new and unique. No. They are looking for familiar patterns. The first pattern they look for is the pattern made by the chess pieces: the position of the pieces on the board and their relationship to each other. I will call this ‘situation-pattern’ recognition. 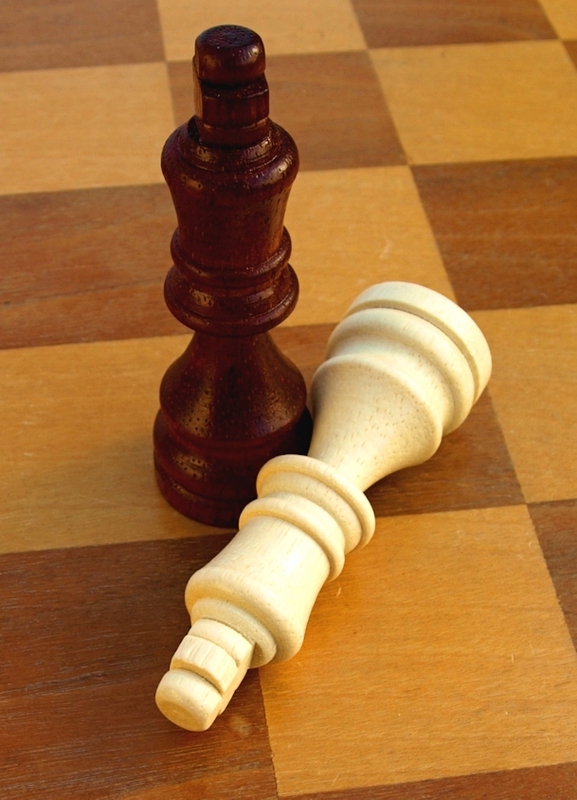 According to Chase and Simon, the player will then consider a possible move and hold, in their mind’s eye, the new pattern made by that move, and then consider the next possible moves for their opponent and the new patterns that would be created, and then consider how they might react to these new patterns, etc. In other words, a methodical and iterative process, working through the consequences of each proposed move by imagining the new patterns created and then the next pattern, and the next, and the next. Maybe that is how a novice chess player makes a decision, taking ages to ponder all the different patterns in their mind’s eye. But expert chess players make their decisions fairly quickly. For an experienced player, I believe their second pattern seeking task is far more complex than a simple review of the next layer of patterns down a decision-making tree. Experienced chess players will be remembering when a similar situation-pattern was encountered and what happened next. I will call this ‘option-pattern’ recognition. (1) Situation-pattern recognition: remembering a previous situation when the chess pieces occupied similar positions on the board. (2) Option-pattern recognition: remembering the possible moves available in such a situation and remembering the consequences after a move was made. So a crucial skill for a good chess player is the ability to see and recognise patterns. And in order to recognise a pattern, they need to have encountered a similar pattern before. Since there are an awful lot of patterns that can occur on a chess board, this means a good chess player has a lot of work to do stacking up a store of patterns in their memory, to draw on in future games. How do chess players build their memory store of patterns? Firstly, a developing player would be expected to play plenty of chess and to play regularly. ‘Practice makes perfect.’ Doing something again and again seems a logical technique for learning any new skill. In chess, the more games played, the greater number of patterns a player is exposed to, and the greater the number of patterns will end up stored in their memory. But there is a second way of developing pattern recognition skills, and it is this method that seems to separate the excellent chess player from the average chess player. Excellent chess players (experts, Masters and Grandmasters) study the games of past Masters. They look at books which lay out how the Masters played and work through their old games, move by move. Sometimes they do this with the help of a chess board, but an expert chess player soon learns to do this simply by visualising the game in their mind. Why is this second method so important? By studying the past games of Masters and Grandmasters, a chess player will increase the number of patterns stored in their memory depository, just as they do through playing real games. But importantly, by observing the decisions a chess Master makes, the chess player will end up with a set of high-quality patterns. And, developing a range of high-quality ‘option-pattern’ memories is what makes all the difference. In order to become good at chess, therefore, players need to be able to access two types of memories. Situation-patterns and option-patterns. And to improve, a chess player needs to practise regularly and (more importantly) study the games of better players. We may not be chess players and we may know nothing about the game of chess. But we can take these principles and apply them to any skill we are trying to learn; for example, learning a new sport (tennis, golf, cycling) or a new skill (writing, cooking, woodworking). First Step: Just do it. Practise, practise and practise. At this stage, you want to install as many new patterns in your memory store as you can. And you will need plenty of these situation-patterns available to you, before you can properly benefit from the next step. Second Step: learns from ‘experts’. But don’t just listen to what they tell you, because they might not be able to explain how they really do whatever it is that they do. You must study them in action. Watch and follow in their steps. Recreate, as far as you can, their sequence of actions. Model your behaviour on their behaviour.